It’s been a while since I last wrote an article, in large part because I’ve been unwilling to make any financial moves on MTGO before reading the December 6th announcement about competitive play on Arena. What is announced there could have major ramifications for investing on MTGO, and so I’ve been very cautious. That’s why I haven’t yet published a Guilds of Ravnica Financial Power Rankings article, and in general have been reluctant to encourage folks to make any investments given this uncertainty. Arena has had an effect on MTGO, but not in the ways that many have been saying. MTGO is not “dying”. Cardhoarder has said that until the past week or two there had been no uptick in folks selling off their collections. Standard participation in the MTGO leagues has been higher than ever before, and I can tell from the value of my Modern cards that Modern is seeing an uptick in play now, as it always does after its autumnal low. There has been one area, and one area alone, where Arena has caused a decline on MTGO, and that’s regarding Limited. I’ve seen it in my own engagement with the two platforms, I’ve seen it in the league participation numbers, in the wait times for flashback and cube queues, and on Twitter from many others. The ability to experience Limited for free on Arena, even in low quantities and with a compromised bot-based drafting experience, has really cut into drafting on MTGO across the board. The reason is simple. Drafting on MTGO is a relatively high stakes affair, one that you have to put a lot of money into and perform extremely well in order to avoid losing money. Winning 50-percent of your matches in draft will, on average, mean that you’re losing $3. There’s a lot of stress involved in knowing that you could be down $45 in an hour if you lose a few matches in a row. Drafting on Arena, by contrast, is relatively carefree. Arena drafting is to MTGO drafting what vaping is to smoking — it let’s you get your drafting fix in without putting your wallet at risk. As a result, drafting participation across MTGO has declined even as Constructed participation has grown. Guilds of Ravnica competitive draft participation was roughly equivalent to that of Hour of Devastation (consistently sustaining about 600-650 participants). Ixalan consistently sustained about 700-750 participants, Rivals of Ixalan 750-800, and Dominaria 850-900. That’s a 29-percent decrease from Dominaria and a 14-percent decline from Ixalan. What really clued me into the decline was that Innistrad flashback queues for Halloween were taking about 30 minutes to fire where before they had taken only about 10. I can just tell that people aren’t willing to fork over an arm and a leg to draft on MTGO like they were in the past. You can tell that Wizards is aware of this fact because a few weeks ago they brought back a means to play the flashbacks for $6 instead of $10. I think they are going to have to make drafting cheaper overall to drive up participation (and profits), which would be a boon for consumers. One eye-popping result of the decline in draft participation is that Guilds of Ravnica prices are very very high. 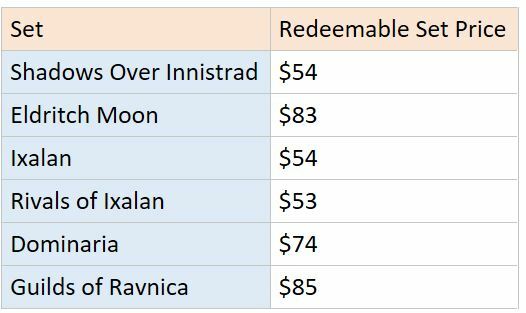 You can buy a redeemable set of Guilds of Ravnica for $85, which is higher than for any set in recent memory. II. Why is the December 6th Announcement so Important? Investment on MTGO requires that Constructed be played, as Constructed demand determines individual card prices. The reason that Standard card prices have done so well (and I mean really well! My investment returns on Core 19 and Dominaria cards has been almost 100%, and my Ixalan Block investments have improved toward close to 60%) is that most players can play Standard on MTGO more cheaply than they can on Arena. Magic Online offers real prizes so there’s a real metagame. Because of the existence of a real metagame, players who enjoy the thrill of competition want to be able to adapt to the metagame and change decks, which is something that will cost you an arm and a leg on Arena. If on December 6th a serious reason to play Magic competitively on Arena comes into existence– for example, if you can actually make money by performing well, if your performance can gain you entry into major stake Magic tournaments — it is likely that Magic Online will take a serious hit. That’s not set in stone — there’s still a serious money problem on Arena, and the monetary barrier to acquire a collection to enable you to realistically compete in top-flight tournaments will be enormous –, but it would at minimum signal an intention from Wizards that it wants competitive Standard Magic to be done on Arena. That would be enough to make me squeamish to continue to invest in Magic Online. If the announcement is something else — if the announcement involves a revamped ranking system, or Standard streamer showdowns, or an invite-only tournament series done on the platform and streamed on Twitch — then that will give me confidence to continue investing in Magic Online, and specifically in Guilds of Ravnica. What matters to me as an investor is whether playing Standard at a reasonably competitive level continues to be best done for most people on Magic Online. What I’m trying to discern from the announcement is the long term vision for the Arena platform — is it going to remain singularly committed to providing a Hearthstone experience best of ones and all, or is it going to lay the groundwork for traditional competitive Magic to be played on the platform? Another major issue — perhaps a more major issue — is the continued pummeling being done to card values due to Treasure Chests. In my next article I’m going to delve into some key ways that the MTGO economy could be “saved” and made more healthy. If you have any questions, please let me know, either in the comments or on Discord. My hope is that the Arena announcement won’t be anything too serious and that I’ll be able to do a financial power ranking article for Guilds of Ravnica in good conscience this month. But definitely stay tuned to the December 6th announcement, as it could be very important and signal Wizards’ visions for both MTGO and Arena for the coming months and years.